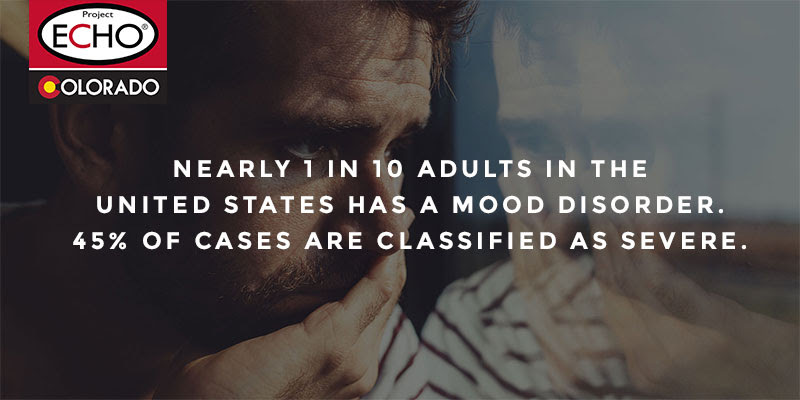 The term mood disorder describes a variety of illnesses including major depressive disorder, bipolar disorder, persistent depressive disorder, cyclothymia and seasonal affective disorder (SAD). Proper identification is as important as proper treatment. This free, six-week series in partnership with Colorado State Innovation Model (SIM) and the University of Colorado Department of Family Medicine, is open to primary care providers (DO, MD, NP, PA) and behavioral health providers working in an integrated practice. The aim is to better manage the common behavioral health conditions that present in their scope of practice. Participants will learn more about screening, diagnoses, and treatment of common mood and anxiety disorders within the primary care setting with a focus on pharmacological and non-pharmacological treatments for different scopes of practice, and use of community/referral resources.